Our fourth annual Salary Survey for Banks and Credit Unions has just published, making available cutting-edge data that accurately helps HR professionals in the industry tie pay to performance. “We do this survey to not only capture the information and put it to work for our own clients, but to provide an additional source for the market at large,” explained Compensation Director and Economist for BalancedComp, Anthony Bieker. Our own industry-leading salary administration software relies on multiple sources to inform our data, and we strongly recommend that all HR departments utilize multiple salary surveys in their benchmark analysis, too. It’s the savviest way to make informed, competitive decisions. 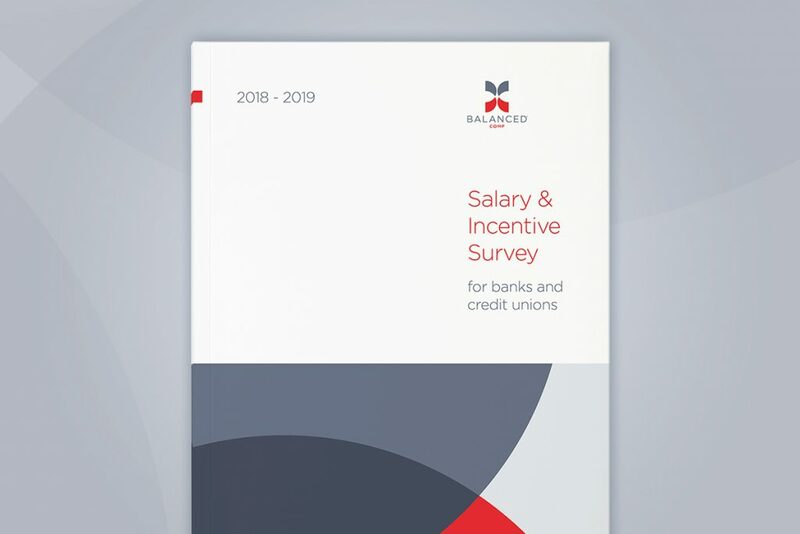 The 2018-2019 Salary and Incentive Survey for Banks and Credit Unions was completed during the summer of 2018. The data informed the most relevant salary ranges, thanks to the participation of 419 organizations at 396 banks and credit unions for more than 120 benchmark positions. Each year, we break down those responses by industry, asset size, and geographic wage differentials, as well as by banks, credit unions, and a cross-section of the two, so that you can narrow down to the exact market parameters for your organization. You won’t find this data in any other financial industry salary survey. Click & Tweet! At the start of the year, the president’s new tax law presented rare opportunity for banks to experience a relative savings and invest that back in their employees. Several top-tier banks responded by raising their minimum wages to $15 per hour, sending shockwaves through the industry. We cautioned mid-size banks and community credit unions to be patient and avoid rash decisions, and we stand by that. The 2018-19 Salary Survey found that, still, only institutions with assets more than $1 billion were increasing wages on Teller I and II and CSR I and II, and doing so at a higher pace than the market. The survey also revealed industry-average turnover rates of about 19.7 percent, and we’re comfortable with this. It’s well within the realm of what we recommend to our more than 200 clients throughout the U.S. This is up from 18.2% in the prior two years. I believe the main reason the average turnover isn’t higher is directly related to how employee-centric most community banks and credit unions are. A recent Washington Post article said 71% of employees are looking for new jobs. 2019 average projection labor budgets increases from 3.2% to 3.5%, due to unemployment rates at an all-time low and employers competing for talent. 2019 average projections for midpoint movement is 2.2% to 2.5%, the fastest market rate movement we have seen in eight years and definite proof that the typical 3% labor budget is not going going to be adequate to stay competitive. This salary survey also reveals the most attractive positions at banks and credit with the greatest demand for pay and talent, and provides the data for compensating them competitively in your market. System & Application Engineers, Information Security Officers, Senior Information Security Analysts, and other IT jobs. We hope this salary guide helps you build a more engaged and productive team, and we invite you to contact us for assistance in building a pay for performance structure. All of this, and so much more, is available in one of the industry’s least expensive, and most valuable, salary surveys. What's new in BalancedResults this month.